HRI - 1061 - Craftsman's Bungalow Border Mirror by Jeff Nelson - Frame size is 32" x 40" and the glass size is 14"x20", 919 piece inlay utilizing 28 species of select Hardwood, Mother of Pearl, Abalone, Malachite and Chrysocolla veneers. This is truly a beautiful work of art that's destined to be an heirloom. Note: This item is priced to include "oversized" shipping & handling fees. Most are in stock and will normally ship within 24 hours. Any item not in stock will typically ship in 4 to 6 weeks. 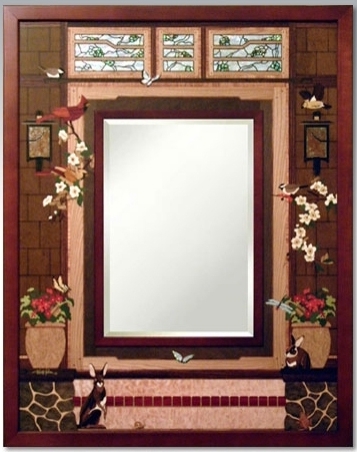 Marquetry is an ancient craft, typically made from select hardwood, shell or stone veneers that are individually cut and then pieced together to compose a picture or image (much like a jigsaw puzzle or stained glass window). The natural colors, patterns and textures of the different materials are carefully selected to support the design. This is a very labor intensive process that has been mastered by the artist, Jeff Nelson.